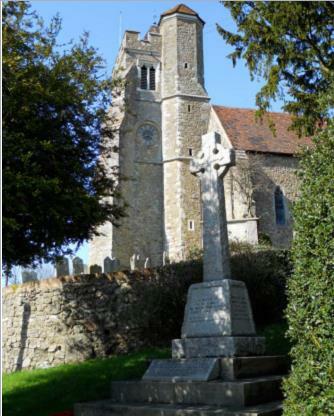 Birling church stands on the site of an Anglo-Saxon church. After the Norman Conquest, the church formed part of the possessions of Odo, Bishop of Bayeux, who became Earl of Kent in 1607. Subsequently, Birling church was owned by the Priory of Bermondsey in Southwark, until the Reformation. At the dissolution of the monasteries, the patronage of the church and property belonging to it were give to the Nevill family, for services rendered to Henry VIII. Generations of Nevills rose to national prominence: Henry Nevill, Lord Burgavenny, was a favourite of Queen Elizabeth I. Two vaults in the Chancel contain the remains of generations of the Nevill family. The location of one vault is not known but the second is opened for viewing from time to time. 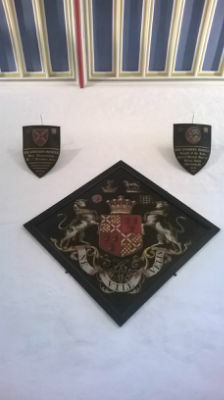 Nevill family memorial shields hang on the chancel walls. instrumentalists provided music for the services. By the middle of the 19th century, the gallery had been removed and the west gallery musicians were replace by an organ, that was installed in 1866, as a gift from the incumbent, the Rev William Nevill, Fourth Earl of Abergaveney.